Doncaster Knights centre Mat Clark will have surgery today on an ankle injury for the second time this year and faces a race against time to be fit for the start of next season. Clark only returned to action in the Championship play-off semi-final first leg ten days ago as a replacement but had been in line to start the second leg prior to a freak training accident on the eve of the game. “He turned awkwardly and dislocated and fractured his ankle,” said director of rugby Clive Griffiths. Clark was one of a several players involved in the first leg to be ruled out of the second at the Madejski Stadium on Saturday due to injury. 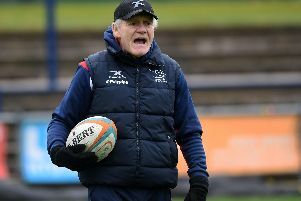 Reflecting on the 39-22 defeat, Griffiths told The Star: “As in the first leg at Castle Park, the best team won though it could have been closer had we had more of the 50-50 decisions. Disappointed with Knights showing in the 35-3 first leg defeat, Knights adopted different tactics to counter Irish’s strengths in specific areas in the return. “I thought the changes we introduced generally worked well and it was pleasing to score three tries,” said Griffiths. “We were in the game at half-time and only trailed 17-15, but they got away from us again in the third quarter as they did at Castle Park.